Gain a competitive advantage Today! Say What!? How Does Yahoo! Increase Search Ad Clicks? One wonders how Yahoo Search revenues keep growing even as Yahoo's search marketshare is in perpetual decline. 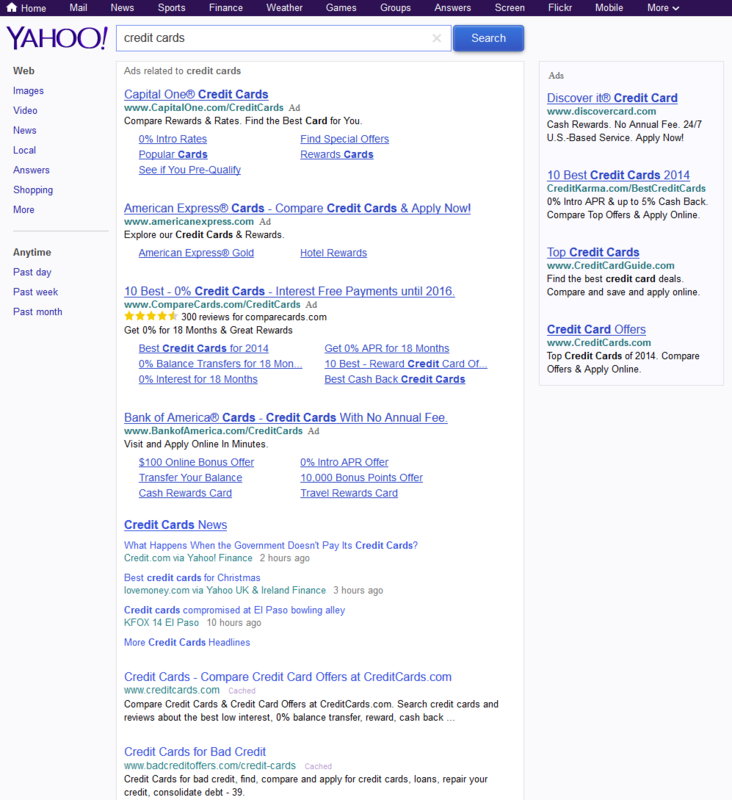 Then one looks at a Yahoo SERP and quickly understands what is going on. They also have other inclusions like shopping search, local search, image search, Yahoo screen, video search, Tumblr and more. Here are a couple examples. This one includes an extended paid affiliate listing with SeatGeek & Tumblr. This one includes rich formatting on Instructibles and Yahoo Answers. This one includes product search blended into the middle of the organic result set. New to the site? Join for Free and get over $300 of free SEO software. Once you set up your free account you can comment on our blog, and you are eligible to receive our search engine success SEO newsletter. Already have an account? Login to share your opinions. Your top competitors have been investing into their marketing strategy for years. Now you can know exactly where they rank, pick off their best keywords, and track new opportunities as they emerge. Explore the ranking profile of your competitors in Google and Bing today using SEMrush. Enter a competing URL below to quickly gain access to their organic & paid search performance history - for free. See where they rank & beat them! Comprehensive competitive data: research performance across organic search, AdWords, Bing ads, video, display ads, and more. Compare Across Channels: use someone's AdWords strategy to drive your SEO growth, or use their SEO strategy to invest in paid search. Historical data: since 2009, before Panda and Penguin existed, so you can look for historical penalties and other potential ranking issues. Risk-free: Free trial & low price. Join our training program today and get the Google rankings, search traffic, growth, and profits you deserve! Not convinced? Try our free 7-day course for beginners. After viewing it we hope to see you join our community! Best of luck growing your business & we hope our site helps increase your rankings! In Short? We offer the #1 SEO training program. And it comes with tools, videos, a private member's forum, and so much more.